The devastating effect of cyber-bullying is one of the hot topics of our digital age. 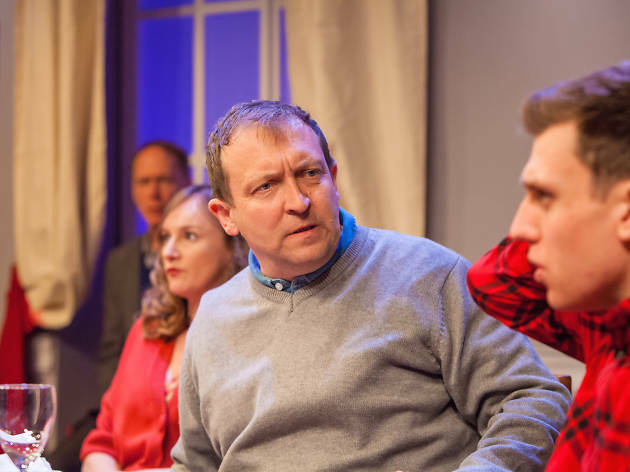 Up-and-coming Canadian playwright Jordan Tannahill confronts this head-on in the harrowingly powerful ‘Late Company’, which makes its UK debut at the tiny, influential Finborough. We meet Deborah and Michael anxiously awaiting guests for a dinner that Deborah, particularly, hopes will offer some kind of closure. They’ve invited Bill and Tamara over, along with their son, Curtis – one of a group of teenagers whose social media taunts have been held responsible for the suicide of Deborah and Michael’s son. Tannahill touches on the cruel immortality offered by YouTube and Facebook, when Deborah and Michael, horrified, learn that videos posted by their son – which, for his bullying classmates, made him a target – are still online. But what ‘Late Company’ really illuminates is the endless, awful pain of loss. 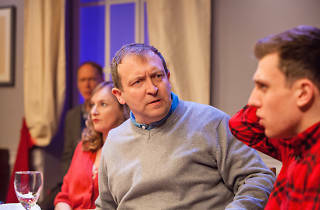 The script deftly sketches the cracks between conservative politician Michael, and Deborah, an artist and sculptor, and their barely concealed contempt for ‘hockey parents’ Tamara and Bill. The play throbs with class tension before this clash of values explodes into anger, defensiveness and recrimination. At just over an hour, ‘Late Company’ covers more ground than many plays twice as long. As the five characters lash out and gouge chunks out of each other’s lives, Tannahill explores everything from attitudes towards mental health to the pitilessness of being gay or different at school. Tannahill doesn’t pull his punches and neither do his characters, as a supposedly cathartic exchange of letters between Deborah and Curtis collapses into a raw pain that’s almost impossible to watch. As Deborah, Lucy Robinson howls in anguish, and David Leopold convincingly captures Curtis’s painfully teenage confusion, guilt and helplessness. Director Michael Yale’s well-acted production cranks up the tension, while delving into welcome pockets of black humour. That’s why it’s frustrating that poor staging makes the very final moment difficult to see, depending on your seat. But this doesn’t blunt the edges of this superb play, which deals compassionately yet unflinchingly with grief’s desperate search for an answer to the question: Why? This show was a gritty and very real portrayal of a family grieving for their son who committed suicide. It shines a light on teenage bullying and the use/abuse of social media sites such as YouTube. The Trafalgar Studios 2 is an intimate space with only three rows of seats, I felt at times as if I was another guest at the dinner party. I thought that Lucy Robinson was great as the inconsolable Mother Debora Hastings, she played the character with raw intensity. Upon arrival we collected our tickets and were ushered downstairs shortly after, where we waited in a rather swanky bar. we had enough time to buy a few drinks which totalled around £7 each, an expected price at a theatre in central London. Before being called in to the show, it was announced by a member of staff that we were about to enter 'the west end's most intimate venue'. Sounds exciting, right? But as a consequence, we were unable to leave the performance throughout the whole 75 minute show, meaning toilet breaks would result in no readmission. The focus of willing your bladder to be well behaved quickly disappears as you enter the incredibly intimate space of 'Studio 2'. Intimate is the only way to describe it, with around three rows of seats cascading from each wall, you could hear and probably see a pin drop. It had an immersive feel to it. There are only five characters all of whom play their own dynamic and complex role. It has to be said, that even though every actor played touching and enticing characters, Lucy Robinson who played Debra absolutely stole the show, with her remarkably convincing performance playing a bereaved mother. it was a powerfully emotional drama which seamlessly managed to inject humour whilst remaining sensitive to the delicate issues explored throughout the play. The play was an intense dramatic piece tackling subjects such as homophobia, depression and the repercussions of cyber bullying. The play's emotive narrative challenged our views as well as educated us on the devastating effects of bullying. It left the audience questioning whether they should know more about the trials and tribulations of their own children's lives. Nonetheless, It did this with a welcome touch of humour. I would highly recommend this piece if you are looking for an original, thought-provoking play that you still want to talk about weeks later. Late Company is an intense, intimate play, perfectly suited to the small Trafalgar Studio 2. The parents of a teenager who committed suicide, invite one of his teenage tormentors, and his parents, to dinner. Presumably one set of parents is hoping for some kind of closure over the death of their son and the other parents are hoping for some kind of redemption. The result is an awkward dinner party of epic proportions; raw emotions, lit occasionally by moments of dark humour. The play is beautifully written and wonderfully acted. The writing is very even handed, you can understand the pain and resentment of each character as they speak, and yet you can also understand why the others cannot forgive. The acting is key to this play, all five are brilliant, but David Leopold as Curtis, the accused bully, is exceptional, his part is a great one, and he delivers it perfectly. Jordan Tannahill, shows all the hallmarks of a very talented new playwright and I will be looking out for more of his work when it comes to London. Another 5 star performance in our fantastic city of London! I had never visited Trafalger studios before and it has two theatres inside. We were in the smaller intimate studio but I think this play on a bigger stage would need to be adapted to work, you need this intimate setting to create the ambience and feel of the play. The play consists of 5 actors, the parents who recently lost their son to suicide and the parents with the son of whom was supposedly a key bully in the reasons for the suicide. The play tackles issues of grief, teenagers, school, bullying and family communications or possibly lack of. Without ruining the storyline the play hits an emotional note and strong subject which is very valid in this society. I did get vibes of a recent Netflix series called 13 reasons why. If you can deal with gritty play with sensitive subject and a solid 75 minute plan with no interval then this is worth every single penny. If you want to watch a play with solid acting which tells a story of relevant (and unfortunate) social expectations and results for teenagers in the digital age, this is really worth seeing. You are so close to the actors and their stage that you are really able to engage in their anger, grief and heartbreak. Just be prepared that you may shed a tear or two if you or anyone you know may have experienced cyber bullying. Tip: The play is 75 minutes long and they will not let you reenter the studio should you need to exit during the performance - so visit the washroom beforehand! If you are looking for a light hearted play.... move along. However I can't stress enough the powerful impact the play had on me and that it is 100% worth seeing. The play tells the story of one of the most devastating experiences; a family grieving their son's suicide, while trying to come to terms with how it happened through a dinner party with one of the bully's and his parents. It is currently running at the most intimate theatre I have been to - Trafalgar Studios, Studio 2. With only 3 rows you feel as if you are actually sitting for dinner with the actors - it really is the perfect venue. The actors were all brilliant, the fact there was no interval meant there was no break from the raw heart breaking story (which works) and the length of play was just right. I "enjoyed" it (not sure that is the right word!). A thought provoking play. Two couples meet at a diner party, with the purpose of discussing an incident of bullying.This is a short, sharp, entertaining, and satisfying drama. Good performances, especially from David Leopold. What an emotional roller-coaster this play was. The play is set in the intimate setting of Studio 2, we were sat on the front row and it made you feel like you were another member set round the table. This play deals with a number of issues head on including bully, suicide, grieve, different parent/child relationships, coming out as gay and how different people deal with these situations. The actors are great and make you believe in the situation they are in. This play is definitely worth a watch. Lots of things to be mentioned. First of all the stage: when you step into this studio 2, you actually step in a very small and intimate room with only 3 rows of seats. The actors are just a couple of meters away from you and this somehow makes the play almost too real and close. I thought this was quite good but I was the furthest away from the actors (I guess the front row must be quite impressive). These are all themes that really need to be raised, especially nowadays. We must raise awareness and plays are a fantastic way to talk to people. But if I'm honest, I think that maybe this play was raising too many subjects and should have focused a bit more on 2-3 tops instead of double the amount. These are all very heavy themes and despite the fact that they could all be related in some situations, I thought this was a bit much for a 75mn play. This play is complex but really interesting and I definitely think it's worth a watch! Bullying, suicide and the trauma of surviving adolescence. Perhaps not the most overtly cheery of subject matters for a night at the theatre but ‘Late Company’, which has a limited run at the beautifully intimate Trafalgar Studios until September 16th following a sold out run at the Finborough Theatre earlier this year, is a show that deserves to be seen by as many people as possible. Written by Canadian playwright & director Jordan Tannahill and based loosely on true events from his hometown of Ottawa, this is 75 minutes of unapologetically tense drama, directed with subtlety and played by the 5-person cast with an honesty that is funny, anxious & heart-breaking. Wound spring-tight with an unsettling feeling of never knowing when the inevitable explosion of raw emotion is coming, ‘Late Company’ follows a dinner party hosted by Debora & Michael for Tamara & Bill and their teenage son, Curtis following the death of their own son, Joel. I found myself so engaged with these characters that I could have watched them dance around each other for another hour but to Tannahill’s credit, he keeps the script tight and the running time short so that we never run the risk of becoming complacent or unaffected by the subject matter of what we’re watching. The cast are extraordinary here, reprising the roles they originated in a play that serves as a brilliant showcase for their talents with Lisa Stevenson particularly captivating. Whether she was nervously making conversation, fuelling her courage with chardonnay or simply watching events unfold around the table, I couldn’t take my eyes off her and watching her silently watching everyone else was every bit as compelling as listening to her actually speak. Whilst the most overtly dramatic moments go to the mothers on stage, the fathers are equally fascinating to watch as they wrestle with what it means to be both a man and a dad and as the youngest member of the cast, David Leopold’s Curtis turns a difficult, often mumbling role into a painful reminder of the difficulty of being sixteen. The most interesting thing about the play is how it challenged my views on things that I both hold an opinion on and know nothing about. My sympathies skewed from one character to another as the main thread of the play wound around and broke like an icy stream littered with immoveable rocks. Tannahill shrewdly illustrates that stories like these are rarely black and white but more a kaleidoscope of bleak, relentless grey. The message that, generally speaking, people are not cruel but are capable of cruel acts hits like a sucker punch as you realise that this is a category into which we all fall and it was this ownership of both the way we behave and the way we treat others that I took away with me as I left the studio alongside a similarly silent and contemplative audience. In this current period of history which often seems cruel and despairingly destined to repeat itself again and again, any piece of art that provokes us into considering how our individual actions can create a vortex of repercussions is, to my mind, well worth taking advantage of. If there is only one play you watch in Aug/Sept, I urge you to make it this one. The premise and the story-line is super. The acting is spell-bounding. The size of the theatre is just right for an intimate performance and the take-home message is powerful. I know I've mentioned it before, but the actors are phenomenal. I know it's a big call, but it is the best performance I've seen recently. Late Company is a superb drama what keeps you thinking about its morals for days. the location: Trafalgar Studios Studio 2 is an intimate venue where you can sit just a meter away from the actors. This closeness involved the audience, I was so near to the events I could feel like another guest of the dinner. It was a great experience to see the actors this close, to notice the little movements and facial expressions. the acting: all the actors were amazing. I could tell they know their characters profoundly (this is the second run of the show). Every motive and every gesture were on point. The only "fake" thing I noticed was the slap. It was a bit of a disappointment as it distracted me from the flow of the show, everything was felt real beforehand. the play itself: an amazing book full with actual questions, topics, problems (bullying, communication problems, parent-child relationships, politics etc.). The writer could show us great examples of copying archytypes (e.g. "bubbly", passive-agressive) and he made it impossible to pick sides. He could show that there are more sides of these problems what one would assume. Throughout the play I was on the edge of my seat. I would show this play to several audiences: teenagers, parents of teenagers, counsellors...everybody can learn from it. The only thing I wasn't happy about is the usage of the stage. The actors were blocking my view with their backs at me (first row's corner on the left) several times during the play. Sometimes they were in a conversation, sometimes they were totally passive. I think the director could have placed them somewhere else (e.g. get them seated, get them stand close to another actor in the centre) to help the audience of my area to see better. Overall I highly recommend this drama. The wonderful acting, the intriguing story and the special location is going to be a great experience for everybody.